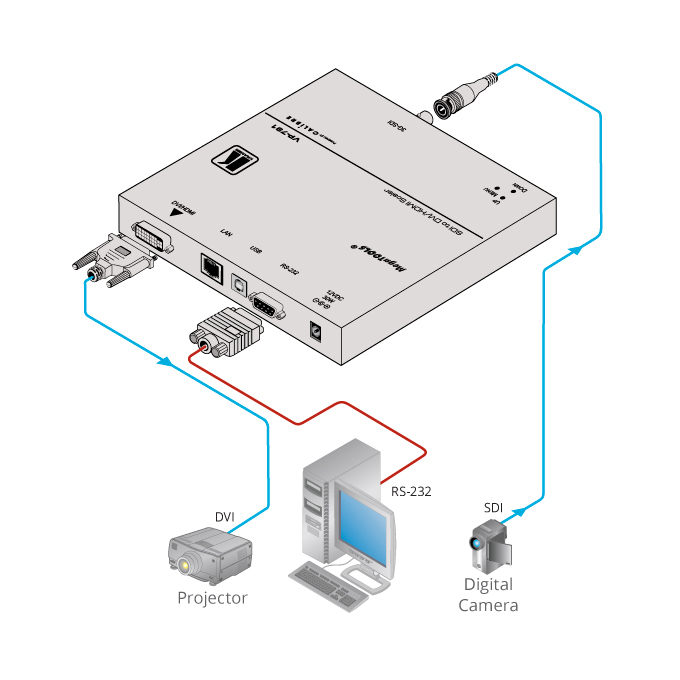 The VP-791 is a high-performance digital scaler for 3G HD-SDI signals. It up- or down-scales the incoming signal, processes the image with HQV and flexible geometry correction and outputs the signal to a DVI/HDMI connector. Powerful Geometry Correction - For off-axis projection, pin/barrel and image rotation. Portrait Mode Image Extraction - Rotation and zoom from landscape input. Flexible Colour Calibration Controls - RGB Gains, RGB Cut-Offs/Black Levels, Saturation, Hue, Brightness, Contrast controls, Gamma selection. Multi-Standard Operation - SDI (SMPTE 259M), HD-SDI (SMPTE 292M) and 3G HD-SDI (SMPTE 424M). HQV Video Processing - HQV (Hollywood Quality Video) processing represents the state-of-the-art in video processing technology, with the highest quality de-interlacing (with 3:2 & 2:2 pull down), 4D motion adaptive SD noise reduction, and outstanding scaling performance for both standard-definition and high-definition signals. Supported Input Resolutions - HD: 720p23.97/24/25/30/50/59.94/60, 1080i50/59.94/60, 1080psf, 1080p23.97/24/25/30, 1080p30/50/59.94/60; SD: 625i (576i), 525i (480i). HDMI Output Support - Deep color up to 12 bit. Selectable I/O Lock Mode - Or frame rate conversion mode. Active 3G HD-SDI Cable Equalization. Flexible Control Options - Built-in Web server RS-232, TCP/IP API, keypad for direct input selection and OSD menu access. Selectable Processing Versus Latency - Best Picture and low latency modes; Best Picture latency as low as 0.25-frame progressive inputs, 1.25-fields interlaced inputs. Non-Voltatile Memory - Auto-saves and recalls settings.